Sutherland had an early ambition to become an engineer but was thwarted by inadequate math skills. 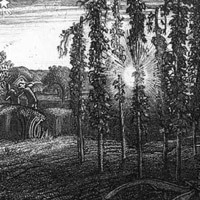 He studied at Goldsmiths and was inspired by Blake and Turner, and especially by the visionary works of Samuel Palmer. At Goldsmiths he met Kathleen Barry, a fashion designer who he married in 1927, and remained with for the rest of his life. Tragedy struck the couple early on in their marriage when their only child, a son, died a few days after birth. 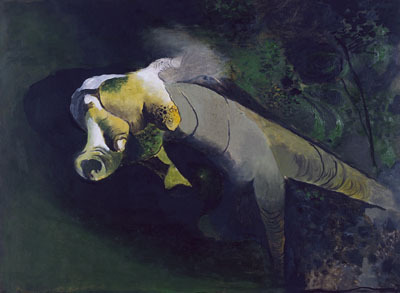 In the following year, they spent considerable time exploring Kent, the verdant countryside southeast of London that Palmer had transformed in his work to a mystical and magical realm. Eventually the Sutherlands bought a house there. Graham began his career as an etcher and achieved considerable success with small, densely packed compositions with nostalgic and quasi-mystical overtones, such as Cray Fields (1925) and Pastoral (1930), borrowing heavily from Samuel Palmer’s work. In Cray Fields, the exaggerated rays of light streaming though the trees allude no doubt to a rapturous morning exaltation. Similarly moving, Pastoral shows plant and tree forms inhabiting a bucolic setting, yet they appear wildly exaggerated and transformed into towering and menacing creatures. 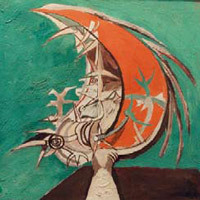 During his early Welsh period, he produced numerous works on paper, including Landscape Study at Cairns (1937) and Tree Form in Estuary (1945), whose overwrought surfaces of harsh but eloquent lines, and acidic yet engaging tones in gouache further convey a strong feeling of anguish and struggle. Here also is more than a hint of redemption. 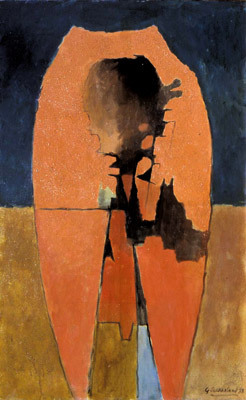 One of Sutherland’s key early works, Red Monolith (1938) corresponds to the experiments of Unit One, a loose affiliation of artists with whom Sutherland often exhibited, including Henry Moore, Ben Nicholson, Barbara Hepworth, Paul Nash and Victor Pasmore. 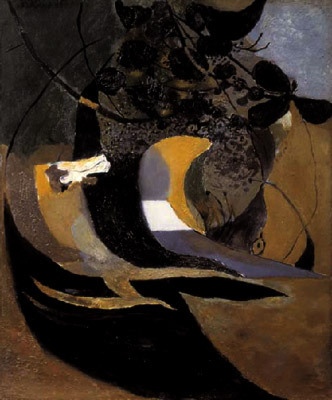 Sutherland’s spare abstraction, based on a rock formation, demonstrates the artist’s interest in ambiguous spatial relationships, which preoccupied him throughout his career. Here, a totemic stone rendered in orange-pink features a dark cavity at the top and tapers to two points at the bottom. Set against a simple background of dark blue and ocher, the composition suggests both microcosm and macrocosm. The richly textured geometric shapes and reductive ground recall certain works by Nicholson, while the fractured landscape elements hint at Nash. 1. Herbert Read: A British Vision of World Art, Benedict Read and David Thistlewood eds., London, Lund Humphries, 1993, p. 88. 2. Graham Sutherland, “Welsh Sketch Book” in Graham Sutherland: Landscapes, War Scenes, Portraits 1924-1950, by Martin Hammer, London, Scala, 2005, p. 70. DAVID EBONY is currently Managing Editor of Art in America magazine. He is also Contributing Editor and writer for Lacanian Ink. Among his books are Emily Mason (Braziller, 2006); Botero: Abu Ghraib (Prestel, 2006); Craigie Horsfield: Relation (Jeu de Paume, 2006); and Carlo Maria Mariani (2002). He lives and works in New York City.